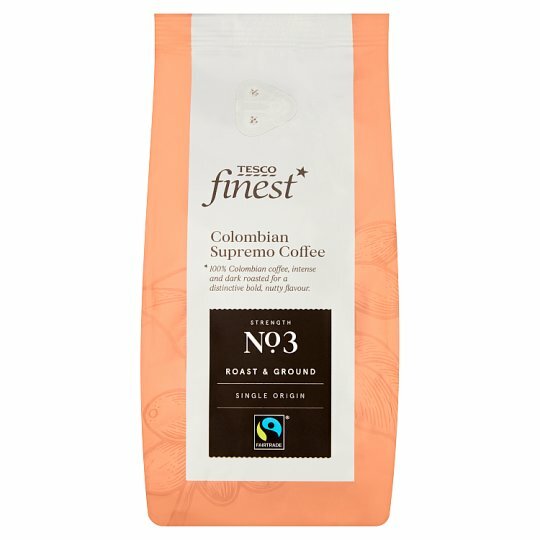 100% Colombian coffee, intense and dark roasted for a distinctive bold, nutty flavour. This full bodied, nutty coffee is grown in Colombia’s volcanic soil at more than 4,000 feet above sea level. We partner with co operatives to support groups of small scale coffee farmers in the central Colombia coffee belt. Farmers like Don Segundo, who lives at his farm, Finca El Provenia and has been producing coffee for more than 55 years. If you’re making coffee in a Cafetière, warm the pot first. Use about onerounded dessert spoonful of coffee per person - you can make it more orless depending on how strong you like it.Once you have boiled the water, wait 10 seconds before pouring, to avoidscalding the coffee, then leave to brew for 3 to 5 minutes - longer for astronger coffee - with the plunger off.You can use the same guide for the quantity of coffee if you’re using a filtermachine. For a Moka Pot, fill the basket evenly with coffee, without patting itdown. Brew the coffee on a medium heat for about 5 minutes.Suitable for cafetières, filter machines, moka pots and percolators.Always follow manufacturer’s guidelines.